There’s something magical about being a kid. It’s a time of infinite opportunities. A time where pillows aren’t just pillows, but the key to a totally rad fort. The forest behind your house isn’t a weird wooded area your parents tell you to avoid, but a mystical land called “The Pond of the Sea Shaws.” That was my experience, and one many shared. As a kid, the world in front of you isn’t what you see; it’s everything you can imagine to be real. That’s what Bill Watterson tapped into with Calvin and Hobbes, his beloved comic strip which debuted thirty years ago today in newspapers. While I was but a wee child when it debuted – I was one and five sixths when the titular duo first greeted readers – it was a major influence in my life, and continues to be to this day. You see, I was always a voracious reader. In elementary school, I was one of the rare students who joined the 500 Book Club, having read 500 books cover to cover by midway through fourth grade (there’s even a trophy to prove it). I enjoyed reading stories of all varieties, but comics made me love reading. And Calvin and Hobbes was one of my favorites. They’d often keep me company during Alaska’s cold winters, as Calvin and Hobbes weren’t just characters I enjoyed—they were friends. I still enjoy them to this day, although the gorgeous Complete Editions are less easy to read in your pajamas than the old softcovers I’d devour. 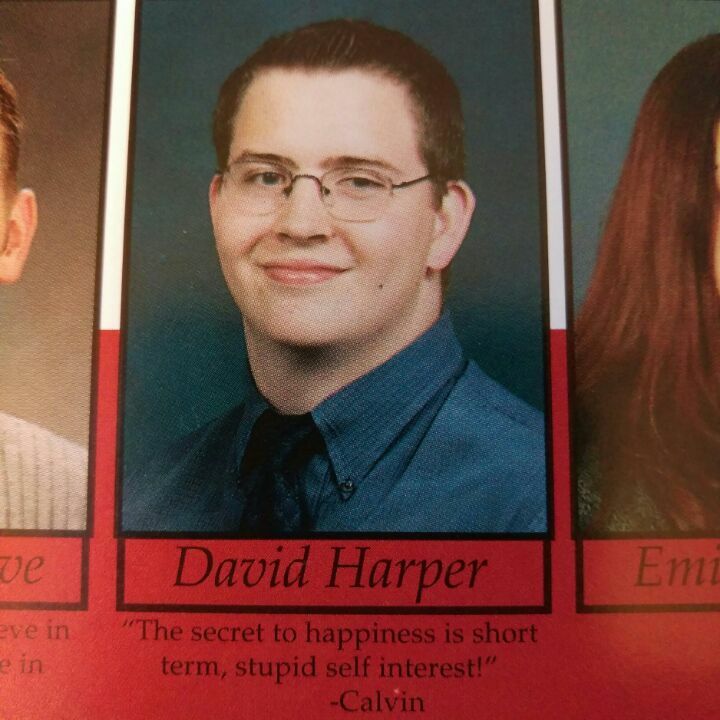 The pair has carried with me throughout, and I commemorate them in small ways, whether that means my senior quote in my last high school yearbook (which you can see to the right) or the cover photo of my Twitter profile. 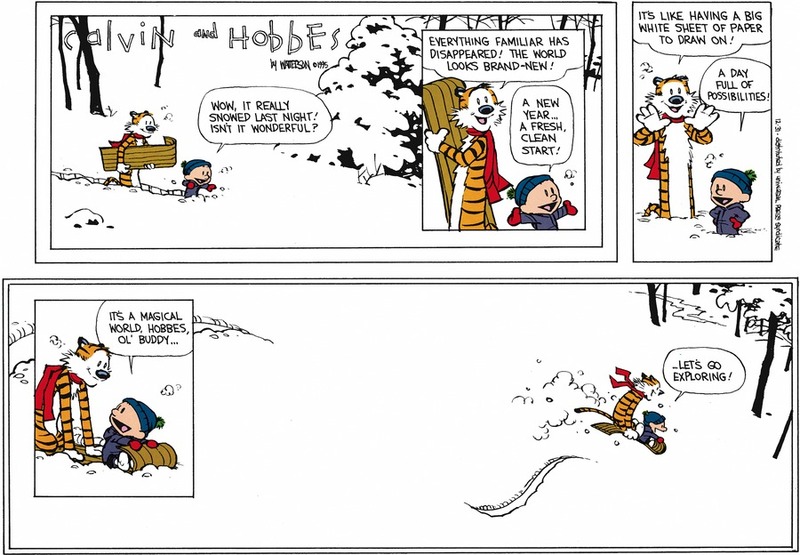 My love for reading has never passed, and it’s thanks to creations like the ones Watterson revealed thirty years ago. It’s not just me, though. Calvin and Hobbes is as beloved today as ever, despite being gone for almost twenty years. Why is that? And what makes it so special to people both young and old? I have my ideas, but let’s find out, shall we? While Calvin and Hobbes is a comic you can enjoy at any point in your life – Watterson mined the same territory Pixar often does with work that amuses people of all ages – there was just something special about your earliest experiences with the comic. Age changes context for any form of entertainment, and what you love as a kid you often love in a different way as an adult, if at all. But when it gets down to it, there was something inexplicably great about Calvin and Hobbes that spoke to young people everywhere. Skottie Young of I Hate Fairyland fame is onboard with that thought. While he can’t recall when he first read the strip, saying it “has been in (his) life for as long as (he) can remember,” he can trace his readership back to newspaper comic sections. As an actual paperboy during the time, Young shared he was “also kind of a Calvin and Hobbes dealer in a way.” That meant he brought joyous daily reads to plenty of kids (and adults) in his neighborhood. Cartoonist Michael Cho (Shoplifter) first read Calvin and Hobbes early in his second decade. He was already a fan of comic strips, like the far more political and current event based Bloom County from Berkeley Breathed. 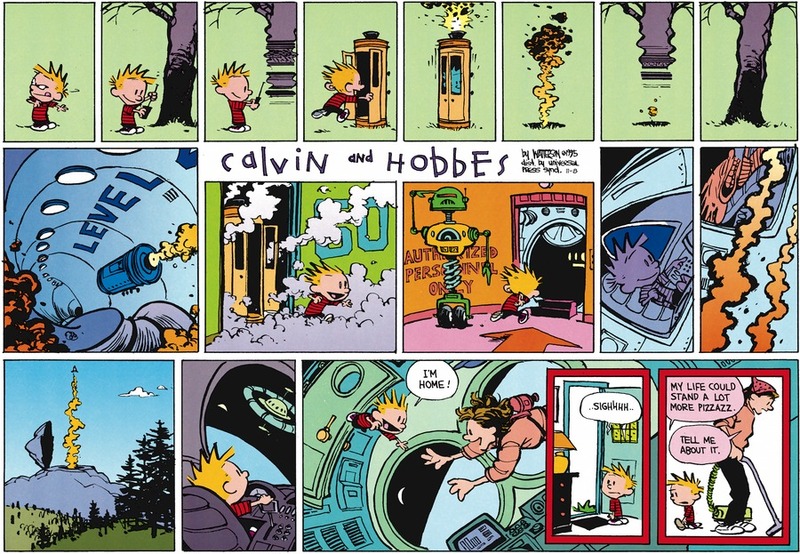 That appreciation of the more experimental side of comic strips carried over to Watterson’s creation, but at first, he simply loved how weird, fun and and beautiful it was. Amulet’s Kazu Kibuishi first jumped into the series sometime around high school, as his local paper didn’t run Calvin and Hobbes. It took a friend of his pointing it out for him to get onboard, and it was love at first sight. “I was instantly a fan of the comic, and it was a big inspiration of mine as I went into college and continued drawing comics for the school newspaper,” shared Kibuishi. For him, the art was a major factor. He was already in aspiring artist mode, and Watterson’s craft as a cartoonist and ability to tackle subjects and emotions of a wide variety was powerful for him as a reader. Mark Tweedale is a columnist at Multiversity Comics, and you may know him as the guy who has forgotten more about Mike Mignola’s comics than anyone else has ever known. What you might not know is Calvin and Hobbes rivals even his love of the Mignolaverse, even if taking it in for the first time down in Australia was by accident. For Tweedale, his love of the comic is personal. He sees a lot of himself in the strip, and it was very meaningful for him during an important time in his life. He appreciated that Watterson always respected what it meant to be a kid, and that he never broke character, so to speak. That respect is enormous, as Young pointed out. For kids both big and little, Calvin and Hobbes was a whole lot of things at once. It was an escape, and an entertaining one at that. It was a comic strip with art at another level than we had come to expect. The characters weren’t just kids; they were little people we could see ourselves in. Like my childhood journeys to the Pond of the Sea Shaws, Watterson created a world we could get lost in. All of that is why so many young readers find something to love in Calvin and Hobbes. While many things you enjoyed as a child fall out of favor by the time you reach adulthood, Calvin and Hobbes is not one of them. Your enjoyment shifts, perspectives change and you notice things you never had before. For Chris Eliopoulos – who discovered it in his first semester of college – the way Watterson approached the comic was a game changer as he began his path towards being a cartoonist himself. The craftsmanship Watterson brought to the table wasn’t just impressive; it convinced him he needed to raise his own game. For the creators I spoke to – all artists – Watterson may not have been a direct influence, stylistically speaking, but the way he told a story left a mark on them. Kibuishi did pin Watterson as personally influential, and he feels Calvin and Hobbes was inspiring for many more people than just him. The craftsmanship Watterson brought to the table impresses no matter your age. For a cartoonist like Jonathan Case (The New Deal), he loved the depth of Watterson’s cartooning. As Young aged, he dug into Watterson’s work more and more, attempting to deconstruct how the book turned out how it did. His experience became more studious, although it never ceased to bring the laughs. One of the most interesting things about how a reader’s Calvin and Hobbes experience changes with age is when the script gets flipped in terms of the characters they relate to. Growing up, we’re like Tweedale, seeing ourselves in the free spirit kid who is excited, awed and disgusted by the world all at the same time. But when you’re the parent who keeps getting killed in polls or has to cook the sentient dinner kids recoil from? That’s a whole different story. It’s a fascinating phenomenon, and one I can’t relate to as I don’t have kids. But it was an oft mentioned shift for the parents I spoke to. It shows how context can change a lot. However, it hardly impacts the love one has for Watterson’s creations. The last point I wanted to bring up relates to a specific quote from Watterson’s interview with the Billy Ireland Cartoon Library & Museum’s Jenny Robb from Exploring Calvin and Hobbes. Robb put together one of the most robust interviews ever with the reclusive creator. In it, they tackled one of the reasons both teens and adults connect with the strip in a new way. Calvin and Hobbes, for all of its childlike glee and hilarity, was a comic that never shied away from bigger subjects and deeper lines of thinking. As Tweedale shared, “it’s this melancholy comic that wears its heart firmly on its sleeve.” In arcs like the one where Calvin and Hobbes discover an injured raccoon, Watterson explored meaningful subjects like life and death in impactful ways. It’s no coincidence Calvin and Hobbes were given the names of a theologian and a philosopher, respectively. 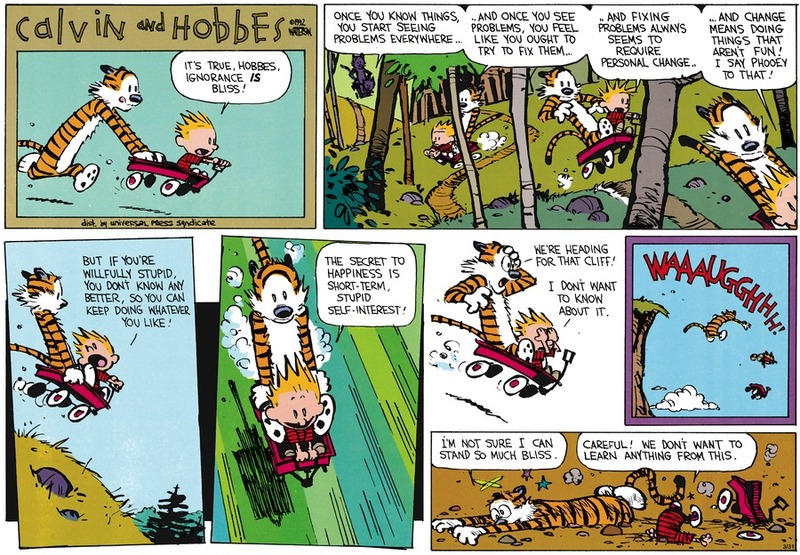 Watterson wasn’t only interested in making people laugh; he wanted to make them think and feel. He did, and he has for thirty years now. You would never want to downplay Watterson’s artistry in determining why Calvin and Hobbes has had such a long and meaningful legacy. However, its creator’s choices outside the creative have helped it maintain its place as such a beloved strip after all of these years. Like Kurt Cobain or James Dean, a creative spirit being extinguished before its perceived time is always a mournful thing. Watterson didn’t pass away, of course. But he chose to end the comic on his own terms, bringing the story to a close with one final strip on December 31, 1995. It was the right time, and it prevented Watterson’s creations from becoming something he didn’t want them to be. Many strips and comics and narratives have done that. They lived on because of popularity, not because the creative drive was there any more. And without that drive, we – the readers – can see something has changed. 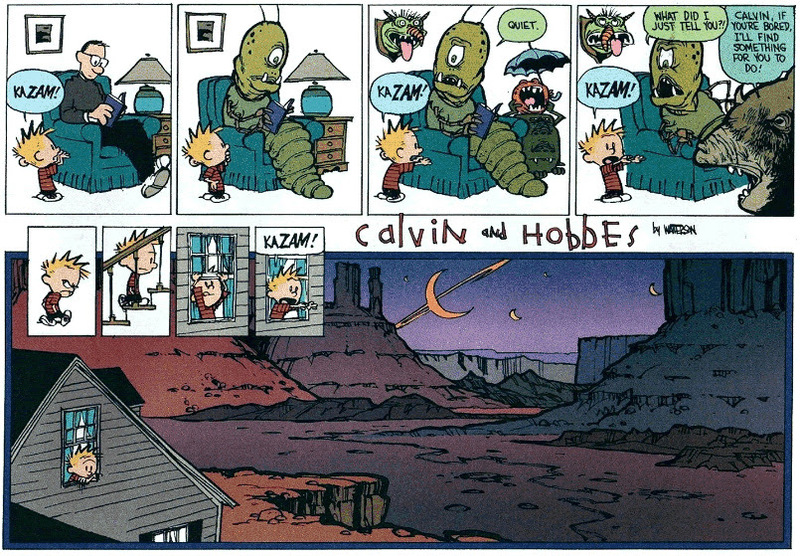 Watterson bowing out before that became a thing helped turn Calvin and Hobbes into something transcendent. It’s something that shocked readers but, looking back, was important to its legacy. Choosing his own end date helped ensure the strip never went through any lethargic stretches. As Kibuishi noted, Watterson displayed remarkable consistency in his ten years on Calvin and Hobbes. “You rarely felt that he created a filler comic strip,” Kibuishi said, and he’s right. Had he kept going, who knows if that would still be true? When paired with Watterson’s steadfast decision to avoid licensing, Watterson’s early shuttering of the strip helped Calvin and Hobbes maintain a purity few comics can match. It was an enormous success, and Watterson’s earned enough from the strip to more or less never be heard from outside of his terms since. There was never a need to go back to the well as many other creators can’t resist doing. And he never leveraged his creations in a way that strayed from who they are. That kept them on a pedestal, and they’ve been there since. Its timeless nature was paramount to its success as well. While many stories attempt to be more relatable by throwing in pop culture references, Watterson avoided that throughout. That means the book doesn’t move on as a relic of its time; it instead is as fresh and easy to connect to as the day it first arrived. “I think his choice to not comment on current events or tie the ideas or thoughts to a year or era is what makes it timeless. Kids are timeless. There has been and always will be little kids who have (a) toy that they know is their friend,” shared Young. “The cartooning was also perfect in its ‘what year does this take place?’ (nature). A striped t-shirt will work forever. His house looks like it is old and brand new at the same time. Every choice he made allow(s) this strip to be relevant to whoever picks (it) up in whatever year. That’s why Young can share it’s something he and his kids can read together now and enjoy just the same. “In fact, we’re starting it for bedtime reading now!” he said. He’s not the only one who had that experience, as Cho passed the collections onto his daughter. Above everything, though, the book has carried on from generation to generation because it was – and still is – one of the finest comics of any variety ever created. It may not be everyone’s favorite, but it’s a comic anyone can enjoy. That speaks to the gifts of Watterson, above all. Calvin and Hobbes continue to entertain, move, challenge, amuse and influence readers as much as they did when they first arrived on November 18, 1985. That means a lot, and it’s because Watterson valued them as more than just creations: he treated them as characters as real and tangible as the person holding the newspaper they were found in. Calvin and Hobbes may have ended twenty years ago this New Year’s Eve, but the story and its characters live on with every reader who sits down with them. The titular duo continues to explore this magical world, and if you’re willing to, you can go along with them on an adventure whenever you’d like. All you have to do is pick up a book. Do that, and they’re back. Just like they never left. All comic strips featured were created by Bill Watterson, with images taken from GoComics.com, © Universal Press Syndicate. Thanks to Jonathan Case, Michael Cho, Chris Eliopoulos, Kazu Kibuishi, Mark Tweedale and Skottie Young for the perspective for this piece.